What's the point in having a Museum that doesn't let in visitors? It seems that one particular museum in the small town of Taiji, on the East Coast of Japan, has something very big to hide. Earlier this year, two Australian tourists attempted to buy tickets to the Taiji Whale Museum and were flatly refused entry by the office attendants. The reason, which is currently the subject of a controversial lawsuit, is more convoluted than it may seem at first glance -- it involves the International Court of Justice, school lunches and the TV series "Flipper." In order to unravel this web of seemingly unrelated topics, it is necessary to go back to 1960, when a young Ric O'Barry first began capturing and training dolphins. O'Barry is now known as one of the foremost specialists on marine mammals, but back then, he captured dolphins for a living and trained them to be stars of the popular television show "Flipper." What O'Barry didn't realize was that his love of dolphins was unfortunately, catching. Flipper did tricks, helped solve crime and even had a "voice" -- apparently the result of a doctored kookaburra's laugh. The show's popularity caused a huge amount of people to want to see dolphins and thus spurred the multi-billion dollarcaptive whale and dolphin trade. Years and many seasons of "Flipper" later, one particular dolphin, Kathy, committed suicide in O'Barry's arms. As dramatic as this claim may sound, dolphin experts have backed up his assertion, arguing that under great times of stress dolphins can ‘choose' not to come up for air. For O'Barry, Kathy's death was a turning point. He realized that capturing and keeping dolphins in captivity was not good for their wellbeing and has since dedicated his life to bringing an end to the industry and protecting dolphins all over the world. Around about the same time as "Flipper" ceased production, another dolphin-related practice emerged. This one however, was not (at least initially) as well publicized. While some still argue that the Taiji dolphin hunts are part of Japanese cultural tradition, they only began in 1969. Since then, every year from September through to March, speed boats are used to round up dolphin pods and drive them, exhausted, into a shallow cove. A net is then used to capture the dolphins and those deemed pretty enough for display are taken and sold for over $100,000 to aquariums around the world. The ‘lucky' ones, who are not sold for a lifetime in captivity, are killed. The dolphins are slaughtered using a particularly inhumane technique -- they are stabbed repeatedly in the back with a metal rod, with a wooden plug forced into the open wound to prevent the water turning red and horrifying onlookers. 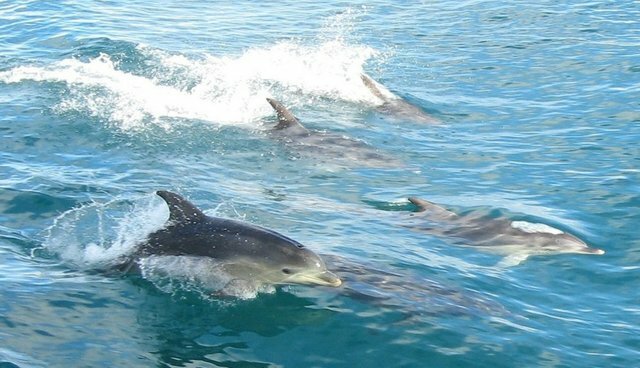 The amount of dolphins killed in the Taiji hunting season varies, but usually sits at around 1,500. The slaughtered dolphins are used for meat, often children's school lunches and pet food. Some studies have indicated that the dolphin meat is highly contaminated with mercury, metyl mercury and PCB's. Japanese fishermen, such as Izumi Ishii who have dared to speak out about the practice, have been ostracized from the small fishing community. Unlike the issue of Japanese whaling in the Antarctic, it is unlikely that the International Court of Justice (‘ICJ') could be utilized to demand respite for dolphins. One reason why not, is that dolphins, while technically classified as ‘small whales' in the cetacean family, are not viewed as whales under international law. The International Whaling Commission and the International Convention for the Regulation of Whaling (‘ICRW') protects whales but not dolphins. Second, is that Australia has a legal interest in what is happening to whales in the Antarctic, because the killing of whales was occurring within Australia's Exclusive Economic Zone. In essence, Australia could take Japan to court because the killing of whales was occurring in Australian waters. What's happening in Taiji with the dolphin hunts is well within Japan's territorial borders, therefore no other country can take Japan to task. However, this does not mean an individual can't. This is what happened recently, when Sarah Lucas, the CEO of Australia for Dolphins and Ric O'Barry served a legal writ on the Taiji Whale Museum. The Museum, which pays homage to whaling, is also one of the largest dolphinariums in the world. Many of the dolphins captured in the dolphin drive hunts are trained and housed at the Museum until suitable buyers come along. One such dolphin, Angel, a rare albino dolphin calf was taken from her mother who allegedly committed suicide amongst the chaotic slaughter. The Museum is one of the biggest tourist attractions in Taiji but refuses to let in those the office attendants see as "anti-whalers." Unfortunately for the Museum, refusing someone entry based on their appearance or perceived ideas is classed as discrimination under the Japanese Constitution. It is also a violation of the International Covenant on Civil and Political Rights and the International Convention on the Elimination of All Forms of Racial Discrimination. The legal writ was served on the 15th May, with the first hearing set for July 4th. It is the plaintiffs' hope that the case will cause the Museum to open its doors to everyone -- whalers and anti-whalers alike. But until the legal case is finalized, the Museum won't be welcoming tourists inside. To do so, would mean public scrutiny of the substandard conditions of captive dolphins held in the Museum, as well as the role of the annual drive hunt in perpetuating the captivity industry. Many Japanese conservationists have publicly spoken about the nature of the hunts, saying that they "are not Japanese culture or tradition." Given our growing knowledge of dolphin intelligence (they recently bumped the great apes down to third place in the intelligence stakes), our treatment of dolphins, both in captivity and in the wild, should be questioned. The recent public condemnation of the Taiji dolphin hunt should at the very least, cause the Japanese government to reassess its very own Constitution, which states that "no nation is responsible to itself alone, but that laws of political morality are universal." Now is the time for Japan to reassess their stance on dolphin hunting and deliver on their post-WWII assurance to be a responsible and peaceful member of the international community.